We like to provide an incentive program for each group selling our products, however as you well know one size really does not fit all. When you call to set up your fundraiser we will be glad to discuss the various programs offered. These will depend on the items that you are selling, the size of your group, and the size of former sales that you may have conducted ect. "What will motivate your students individually as well as a group?" 1. Require each student to sell at least 15 items to fulfill their responsibility to the group. Making this requirement will help you itentify and reward your more highly motivated students. Work with these students to become leaders of your group. 2. 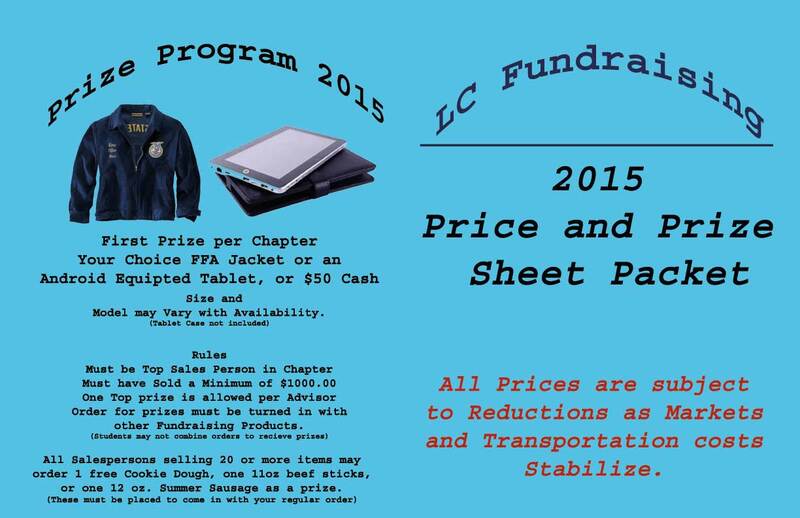 Students who sell at least 20 items will receive an additional reward from L.C Fundraising. Student may choose 1 item from any Cookie, Sweet Spot item, Popcorn, or Summer Sausage, from the sales brochure you are using. In order to receive prize student must order prize by item number as a regular order, sponsor will then subtract total wholesale cost of items before payment. Make sure all prizes are included in your initial order as we cannot ship prizes seperate from the main order due to the increasing cost of shipping and handling!!!! > Others ideas include taking the qualifying students on a day trip to a water or theme park or making sales as an incentive for National Convention trip. Ect..
3. Offer prizes to your top sellers. These may include everything from Shotguns or supplies to those interested in trapshooting, to cash awards given in 1st 2nd 3rd place award ect. 4. Offer a daily reward, say $5 for each day's top salesperson as well as a mention in the school announcements who the winner is for that day. (Caution: do not attach the amount sold as public information, especially if you are offering a top Sales Award). 5. Assign a point value to each contact that your students make giving them extra bonus points for sales made. "What would your students enjoy?" 2. At the beginning of the sale, arrange for someone from our company to Teach your classes for a day, We will do a short course on sales and marketing, allow the students to sample some of the product, and explain the incentive program for the year. You must allow us plenty of time to put you on our schedule as we book up these programs very quickly. 3. Don't forget about order forms from prior sales. Make sure that everyone who supported your organization before is contacted again. 4. Encourage your students to call on local businesses. Have them suggest our products as employee or customer gifts. Sometimes with companies you may have to offer them a better price when a large volume is involved. You may want to provide an added incentive for your students to call on businesses. 5. Spend the first few minutes with every class each day during the selling period checking their progress. The only way to have a successful sale is to monitor progress daily. 7. To sum it up, you will know what will motivate your students better than we will, Any additional ideas that you may have, please discuss them with us as we will consider partnering with you to accomplish your goals.